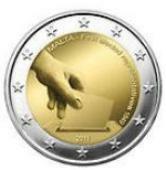 Malta applied to join the Euro zone in February 2007, the Euro becoming the official currency on 1st January 2008. 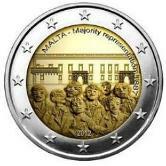 Maltese Euro Coins have an extremely interesting Commemorative series covering the constitutional history of Malta. Some basic facts relating to Malta. 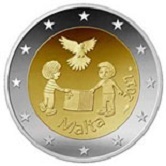 As with many other countries in the Euro zone, Maltese Euro Coins have three motifs - one for the "copper coloured coins"(1 cent, 2 cent and 5 cent), one for the "gold coloured coins" (10 cent,20 cent and 50 cent) and finally one for the one Euro and two Euro coins. 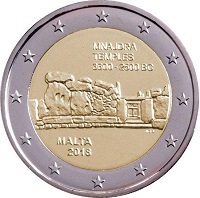 The first motif (1,2 and5 cent coins) is the Mnjada temple. This is believed to have been erected around 4.000 BC thus making it one of the oldest religious sites on earth. 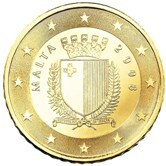 The second motif (10,20 and 50 cent coins) is the Maltese Coat of Arms. 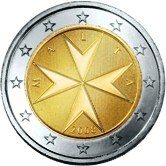 The third motif (1 and 2 Euro coins) is the Maltese Cross. 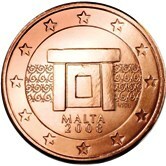 1 cent - The Mnjada Temple. 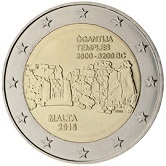 2 cent - The Mnjada Temple. 5 cent - The Mnjada Temple. 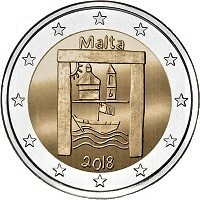 10 cent - The Maltese Coat of Arms. 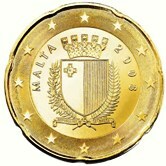 20 cent - The Maltese Coat of Arms. 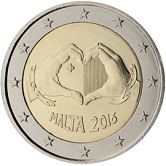 50 cent - The Maltese Coat of Arms. 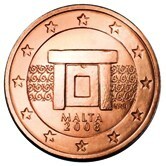 1 Euro - The Maltese Cross. 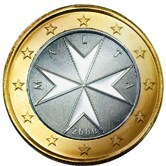 2 Euro - The Maltese Cross. 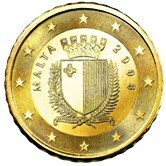 Around the rim of the Two Euro Coin appear "2" (6 times), each "2" inverted with respect to the preceding and following "2". 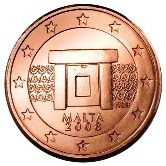 The "2s" are separated by two Maltese crosses. 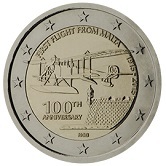 Maltese Commemorative Two Euro Coins. 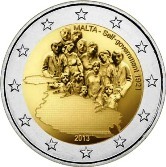 Although Malta has only been in the Euro zone since 2008, it has already issued eleven attractive commemorative coins. Well done Malta! 2011 - A hand is shown putting a ballot paper into the ballot box. This commemorates the first election of representatives in 1849. 2012 - People are shown in front of the Maltese parliament. Commemorated is the 1887 introduction of majority representation. 2013 - Introduction of Self Administration 1921. 2014 - Independence from Great Britain in1964. 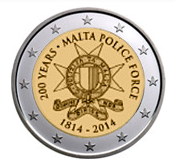 2014 - 200 years since the founding of the Maltese police. 2016 - Prehistoric Temple of Ggantija. 2016 - Solidarity through Love. 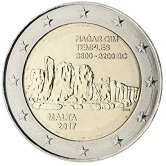 2018 - Temples of Mnajdra (4,500 - 5,600 years old). 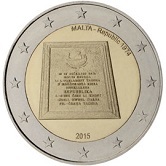 Return from Maltese Euro Coins to Links to Specific Countries. 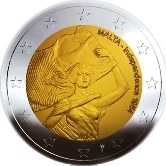 Return from Maltese Euro Coins to euro coin collector.